With the greatest writers or directors, you aren’t simply reading a book or watching a film: you’re entering a world. Sometimes that fictional world can have a big influence on the real one, changing the way we think of some aspect of life or society. The worlds created by Charles Dickens did that – and continue to do so. He changed the way people think about education, prisons, religion and the legal system, among many other things. He also changed the way we think about the biggest festival of the year: Christmas. He did that with a story about ghosts and the dead. I’m talking, of course, about A Christmas Carol, which was first published in 1843. He once had a partner called Jacob Marley, a miser just like himself, but Marley has been dead seven years and Scrooge is terrified when his old partner’s ghost appears to him one Christmas Eve in his cold and empty house. The ghost has a warning for him: his mean and money-worshipping ways will doom him to a miserable wandering existence in the afterlife. That is what has happened to Marley, so he now wants to warn Scrooge and give him a chance of changing his ways. He tells Scrooge that three spirits will come to him during the night: the Ghosts of Christmas Past, Christmas Present and Christmas Yet To Come. Scrooge tries to persuade himself that he has imagined all this, but the three spirits appear to him just as Marley foretold. Scrooge is shown himself as a boy in the past, long before the love of money made his heart cold and uncaring. In the present, he is shown Bob Cratchit and his loving wife and family, including the crippled Tiny Tim. And then he is shown disturbing visions of the future and of what will happen if he continues his miserly life. Dickens’ writing is very powerful: the characters he creates and scenes he describes appear in your imagination almost as though you’re really witnessing them. You almost see Scrooge’s red nose and the fog swirling along the streets of London, hear the chimes of midnight bells and the clank of Marley’s chains, and smell the rich odour of a cooking goose and the steam of Christmas pudding. And you may even shiver at the darker parts of the story: not just the eerie apparition of Marley’s ghost and the three Christmas spirits, but also the description of a dead man and the thieves who steal his belongings because he has died friendless and alone, completely unmourned and uncared for. That is a vision of Christmas Yet To Come and Scrooge slowly learns the horrible truth: the dead man will be no-one other than himself. He is also horrified by another vision of the future: an empty corner in the Cratchit house, where Tiny Tim should have sat, bringing happiness and laughter to his parents, brothers and sisters. Dickens is using two very powerful emotions in this part of the book: our fear of dying alone and our horror when a child dies young. In the story, these visions transform Scrooge and his view of the world. He sees that money is bringing him no happiness and will take him to a friendless death. And as his heart begins to melt, he sees how rich Bob Cratchit is in the things that matter. Bob might have little money, but he has the love of his family. 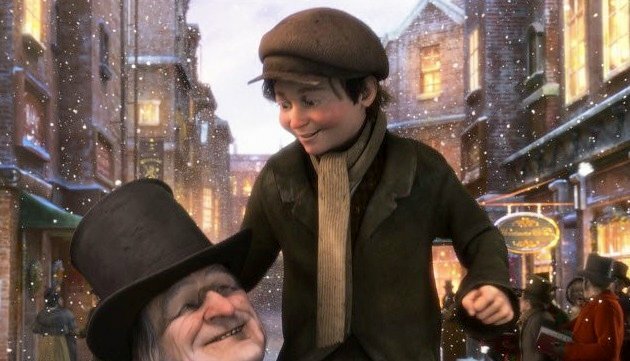 Because Scrooge now understands the importance of love and companionship, he is horrified by the thought that Tiny Tim will be taken from the family. That’s why, after spending the night of Christmas Eve with the Three Spirits, he wakes up on the morning of Christmas Day determined to stop those future visions coming true. He will change his ways, become generous with his money, not mean and grasping, and try to bring happiness to those around him. He succeeds completely: Tiny Tim does not die and he himself lives surrounded by true friends and loving relatives. A Christmas Carol is a very short book, less than 30,000 words long, but Dickens creates an entire world in that brief space – or two worlds, the world of the living and of the dead.